Captain Charles ‘Chic’ Eather, born 1920, has had a long life. 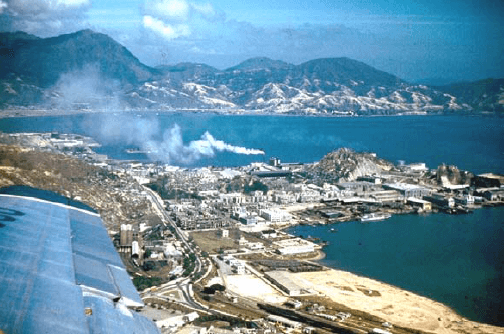 A great part of his working life was spent in aviation and much of this was connected to Cathay Pacific, Kai Tak airport and aircraft maintenance companies at the airport post WW2 and up to his retirement in 1975. His biography Syd’s Last Pirate was published as a CD-Rom. It is a detailed and fascinating account involving many characters, locations and incidents. And at times tales of great excitement, courage and danger. Chic has very kindly sent me a copy of the CD with the assistance of Ray. I thank them both. Chic was born on August 2nd 1920 in Sydney, Australia. In 1940, he became an anti-aircraft gunner and was discharged whilst waiting for his Air Force call-up. In the interim he joined the Merchant Navy and took his anti-aircraft friends to Suez. While on the high seas he missed his RAAF call-up and was removed from the list. 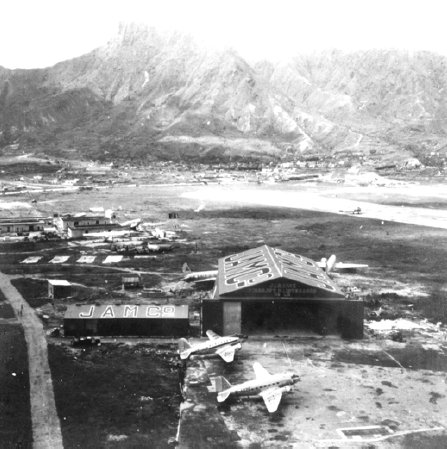 With the money he saved as a Merchant Mariner he completed his flying training (that had begun in 1936) becoming a first-officer with Ansett Airways and concurrently commissioned a Flying Officer with the Citizens Air Force Reserve. 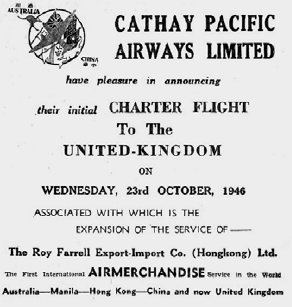 In 1946 he joined the fledgling Roy Farrell Export-Import Company, the forerunner of Cathay Pacific Airways.He flew during the Karen Insurgency in Burma for the Union of Burma Airways. 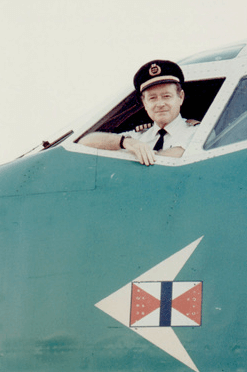 In 1953 he returned to Cathay Pacific and stayed with them until his retirement in 1975, amassing 25,000 flying hours. Chic retired to the Queensland Gold Coast with his Chinese wife Judy. The following images have been extracted from Syd’s Last Pirate with added comments in square brackets. 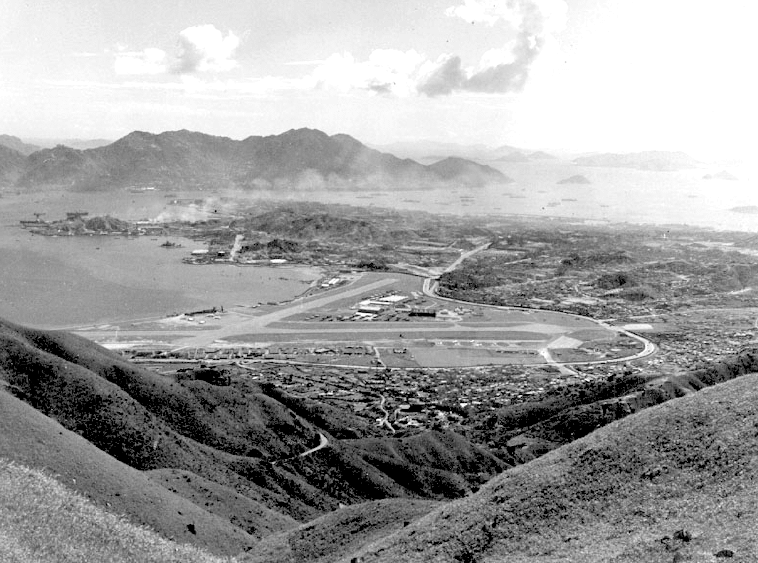 Joining the circuit for a landing on Runway 13, Kai Tak. The Green Island Cement Company continues to emit smoke pollution. The Jamco Installation prior to installation. This article was first posted on 19th October 2014. Would you have any information on a Dr Frank Joseph Molthen? A chiropractor that was in Hong Kong ? Do you have any information on a Dr Frank Joseph Molthen? A chiropractor that lived in Hong Kong ? I don’t have any information about Dr Frank Joseph Molthen. However, if you search for his name on gwulo.com a number of references pop up and if you contact gwulo directly this may lead to further information. 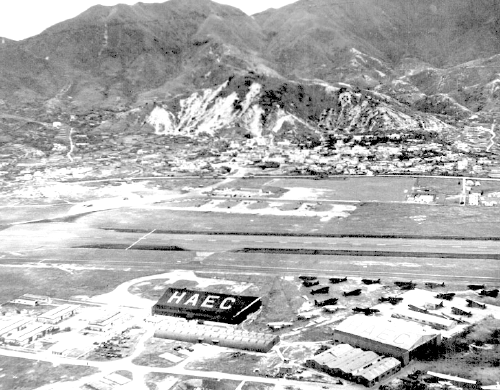 Growing up my father hardly spoke of his youth in China and HK in the 40’s and 50’s but i remember him saying the name Chic Eather with deep respect and fondness on more than one occasion. Today stumbled upon his website and photos of my dad, Fred Melbye and Chic.